Flying drones can help potato farmers in making vine desiccation decisions by mapping their crops before applying herbicides. 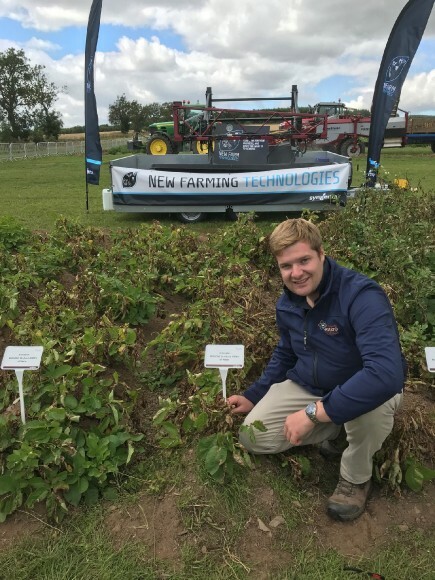 Trials of potato crops at Potatoes in Practice conference last week showed how growers could tailor water volume and nozzle selection when using herbicides, after imaging scans by drones revealed the most dense areas of foliage. Increasingly, new precision farming technology such as drones, data gathering bots and AI are greatly assist farmers and growers make more informed choices for their crops. Many are already using drones to create maps or visualisations of their farms and crops. Syngenta application specialist, James Thomas said using drones can focus vine kill efforts; a key decision for potato farmers before harvesting. “With the determinate variety, which may well already be senescing - particularly after the hot dry summer of 2018 - using just 200 l/ha of water achieved excellent results in opening up the crop,” Thomas said. He believed the technology when combined with improved nozzle and spray application techniques could improve efficiency and reduce the drift of herbicides. “We have seen performance continue to improve with testing new designs, such as the Lechler twin outlet nozzle. There is clearly potential to give good foliar coverage for desiccation, along with better targeting by reducing risk of drift,” Thomas said. “Adoption of drift reduction technology application is also an increasingly important element of regulatory product re-registration, to help ensure options remain available for growers,” he added.